Soybeans lose gallons of water daily during hot, dry conditions through transpiration. Plants transpire, or lose more than 98% of water taken up by the roots, through leaf tissue. Evapotranspiration (ET) describes the movement of water through evaporation from the soil and transpiration through plant surfaces, which is the movement of water from the soil into plant roots, through plant stems and leaves, and back out into the atmosphere. The rate of ET depends upon the soybean growth stage and the time of the year (Fig 1.) Both transpiration and evaporation need to be considered when it comes to irrigation scheduling. Figure 1: Soybean water use with select growth stages. To effectively use weather-based crop water use estimates, producers need to estimate how much soil moisture is available for plants uptake (Table 1) and how much is being used by the crop in a given day. See the soil profile figure (Fig 2). 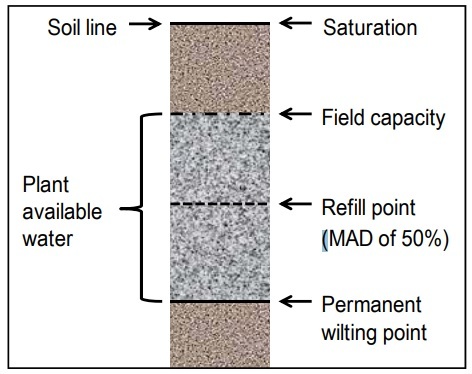 Figure 2: Showing the soil water content. Not in plant favor if the soil moisture drops to the permanent wilting point level. 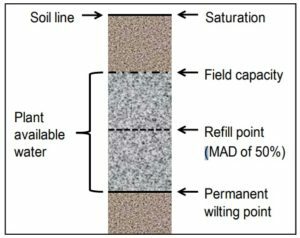 The Maximum Allowable Depletion (MAD) indicates when irrigation should be applied. Potential yield loss occurs at MAD level. If soil moisture sensors are used, keep in mind approximately 70% of plant roots are within the top half of plant root depth. This results in about 70% of soil water use also occurring in the top half of plant root depth. Calibrating and placing sensors within the root zone will provide precise measurements of soil moisture for irrigation scheduling. Please see table 1. It may come in handy.